STEP 1 - Hold Tow-eye in mounting location and check fit. 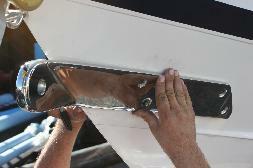 If fit is a little off don't worry, the bolts will tighten the tow-eye tighter against the hull. STEP 2 - Trace outline of Tow-eye. 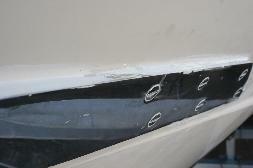 STEP 3 - Rough up jellcoat surface inside marked area for better bonding of adhesive. 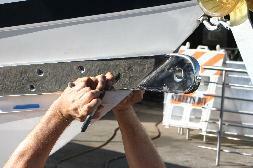 STEP 4 - Hold Tow-eye in mounting location and drill the forward most hole on both sides of hull. 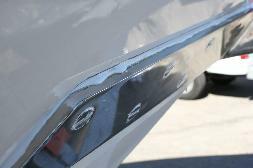 This step will help hold the Tow-eye in place for step 7. 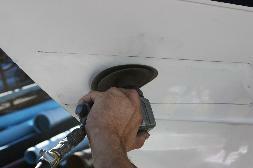 STEP 5 - Generously apply 5200 marine adhesive to the inside mounting surface of Tow-eye as pictured. 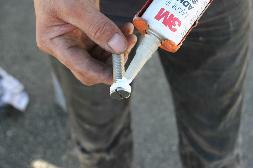 STEP 6 - Also apply 5200 around the back side of bolt heads to assure a watertight seal. STEP 7 - Hold up Tow-eye in location and insert forward bolt into pre-drilled holes to help aline and hold Tow-eye in place. STEP 8 - Install backing plates, flat washers, and ny-loc nuts and snug down first set of bolts. STEP 9 - Drill hole #2 on both sides of hull and snug down, and so on. DO NOT attempt to drill all the holes at one time. 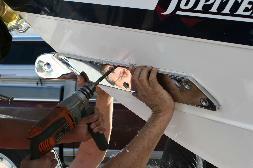 STEP 11 - Once the Tow-eye is tightly mounted, use Mineral Spirits to clean excess 5200 from edges. 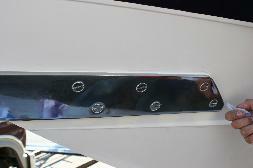 Wipe 5200 evenly around all edges and into bolt heads for a nice finished look.